Hale Irwin missed shooting his age but still settled for a 10-under 62 in yesterday's second round. HUALALAI, Hawaii » You have to forgive Hale Irwin for being a little anxious at the final hole during yesterday's second round of the $1.7 million MasterCard Championship at Hualalai. 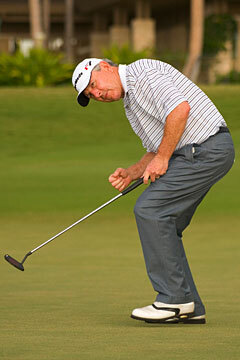 The 61-year-old hasn't had a putt that would equal his age before. Standing over the makable 12-footer for birdie, Irwin did the unforgivable by leaving it short to settle for a 10-under 62 for a two-day total of 16-under 128. He is three shots clear of Tom Kite, who fired an 8-under 64 yesterday to put himself into contention, and first-round leader Brad Bryant (68). But at the time, being first on the leaderboard wasn't all that was on Irwin's mind. He's done that plenty of times before. His goal was something else entirely. "All of a sudden I started thinking how many birdies I needed to shoot my age," Irwin said after making four consecutive birdies for the second time in his round. "Why not, that's a different goal. I had never even thought about shooting my age. So, here we go. "Bang, I birdie that 16th hole and goodness gracious I have two short irons to shoot my age. 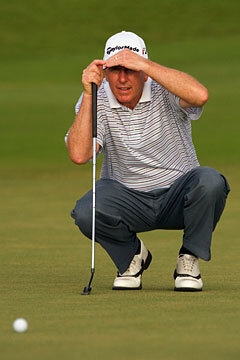 After making the putt at 16, I went up to Loren (Roberts) and said, 'You know, my goal is to shoot my age.' He said, 'Don't even talk about it.' So, come down to that last putt at 18, the line was a little tricky. I had the right line, my caddie had the right line, just worked too hard on the line and forgot to hit it. "So I guess you could say I choked. I had a chance to shoot my age for the first time ever, but hopefully it won't be the last time." It was the only mistake Irwin made in his bogey-free round as Hualalai Golf Club was at the mercy of the senior circuit for the second straight day. The Jack Nicklaus-designed course surrendered 29 rounds in the 60s to produce the lowest scoring average in the second round here at 68.390 among the 41 golfers in this winners-only event. Through 36 holes, only Bob Gilder is shooting over par. Roberts (67) and Jim Thorpe (63) are tied for fourth at 12-under 132 to trail Irwin by four shots. Considering how he's playing, that may be too many, although Irwin said someone could come out of the pack and shoot another 62 to put the pressure on him. In his mind, he can't sit back and play defensive or he'll get passed. "I have to shoot a 65, 66, or 67 and put pressure on the guys in second to shoot a round like I did today," Irwin said. "We've had some benign conditions here and unless that changes, you're going to have to go low to win this tournament." Kite agrees with Irwin's assessment of today's final round. His 64 yesterday could have been even better had a putt here or there fallen in, including an 88-footer for eagle that missed going in by only 4 inches. Kite was too far away to see it, but he heard the crowd groan and knew it had come close. "I started walking as soon as I hit it, but I was still 50 feet away when it got close to the pin," Kite said. "Wouldn't that have been something had that gone in? I like how I'm playing and I like my position. The guys are playing well; someone could come out of the pack and shoot a 63 or so. But it's still going to take some good golf to catch Hale." Both golfers have managed to win this event since it moved to the Big Island in 1997. Irwin won it that first year it was here and Kite took home the first prize in 2002. But he can't compare to Irwin's success here in the island chain. In all events, including the Senior Skins, Irwin has won nearly $4 million in the island chain. "This has been a wonderful place for me," Irwin said. "I don't have to say it's one of my most favorite places in the world, it is. Coming back here and playing as I have feels almost natural." Hale Irwin put himself in position to win the Senior Tour's winners-only tournament with a 10-under 62 yesterday for a two-day total of 16-under 128. Paired with Champions Tour player of the year Jay Haas on Friday, Irwin opened with a solid 66 to prove to himself that he was back after a subpar year for him in which he failed to win a tournament for the first time in his 11 seasons on the Champions Tour. Yesterday, his playing partner was Roberts, the defending champion, who finished second to Haas in the Schwab Cup race and became the first person in Champions Tour history to win the first three events of the season. Irwin said after yesterday's round that he found inspiration from them because he believes they are the Champions Tour. "It's also been helpful playing with Jay and Loren," Irwin said. "Two of the more inspirational guys playing on the tour. Two of our very best players and two real gentlemen. I was lucky being paired with those guys because you're playing with some of our very best. They are the Champions Tour. I suppose there's some motivation when you're playing with the best. They certainly brought the best out in me." That may be, but neither is even close to the 44 victories Irwin has managed since he turned 50 in 1995. That year, he picked up two wins in only 12 events en route to pocketing nearly $24 million in prize money in 272 tournaments. Battling a bad back the last couple of years, Irwin spent the offseason working out, getting his game in shape and preparing for the rigors of the 29-event season. He will turn 62 in June and knows if he wants to stay forever young that it will require even more work than before. Not that 2006 was anything to be ashamed of, far from it. Irwin still managed six top-10 finishes to finish 22nd on the money list with $808,144, but for someone who had never finished out of the top 10 before, it wasn't Irwin-like. "More than anything else these last two days, I proved to myself that I can still play, it's not gone," Irwin said. "It's back and what do I do with it? Do I continue on with it? Now the test is up to me to prove it to myself because I'm the first person I have to prove it to. If I can do that, then who knows?" » Is Act 221 / 215 boosting Hawaii's high-tech sector?